Tennis elbow has many names, the most common being lateral epicondylitis. Anytime we hear a word ending in “-itis” we can make the assumption that there is an acute inflammation response. However, recent literature has shown that with Tennis Elbow, acute inflammation is not the driving mechanism for our pain, but rather is a chronic overuse syndrome that affects the histology of the tendon (1). This term, known as lateral epicondylalgia, is characterized as a sudden onset or repetitive overuse injury to the outside of your elbow (1). 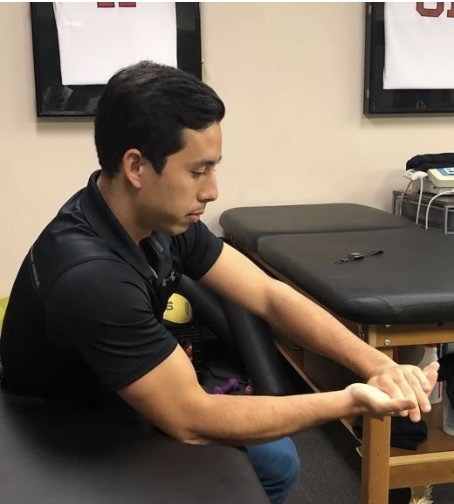 Lateral epicondylalgia is typically caused by repetitive wrist extension and radial deviation that is typically seen during the backhand in tennis. The pain may be elicited with palpation, gripping activities, and resisted wrist and/or third finger extension. 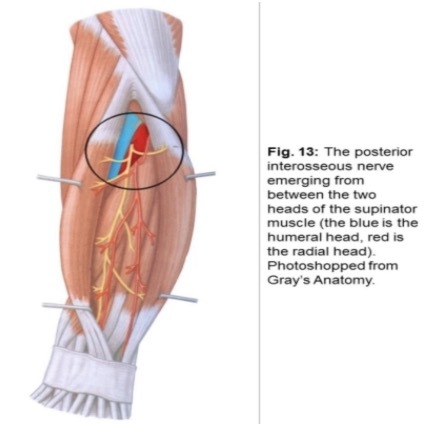 * Typically the most common occurrence is at the origin of the ECRB tendon, which connects the elbow to the hand. 1. Tensile overload - This is your classic “I have done to much too fast” scenario. If you increase your activity too quickly and your body is not ready for those demands, it can cause pain. An example of this is; if you haven’t played for months and then decide to hit one hundred backhands in a single practice, there’s a strong chance that you will have pain the next day. 2. Your grip size is too small or too big - There are many different ways to determine what grip is right for you. A simple way to gauge proper grip size is to use your non-dominant pinky finger. An optimally-sized tennis racket allows your pinky finger to fit between the longest finger and the thenar eminence when gripping your racket (2). 3. A sudden change in string tension - this may cause excessive force towards the lateral aspect of your elbow. If this is the case, a vibration dampener may help, as well as changing the tension levels of your strings. Looser string tension helps generate more power, but at the expense of control. However, higher string tension increases your control but it increases the vibration applied through the wrist, elbow, and shoulder. This can potentially place excessive stress to the elbow leading to pain. Whenever making string tension changes, do so slowly, or make sure you acclimate yourself into playing. First off, you should always seek an experienced clinician when symptoms occur. The reason for this is because the reason for everyone's pain is different. Because of this recovery is not a one-size-fits-all model. Here is an example - lateral epicondylalgia can be misdiagnosed with Posterior Interosseous Nerve Syndrome (PINS). PINS is caused by the compression of the supinator muscle and affects the nerves that pierce through the muscle. This may present with similar symptoms as lateral epicondylalgia, but this is no longer a tendinous injury, but rather a nerve related injury. Although the symptoms may be similar, the treatment is different. Isometrics are a great entry point to reestablishing movement. They help to initiate low-level strength to the area and also serve as an analgesic. An added bonus, they can be done without any equipment. Perform the exercises below for 10 reps of 10-second holds. 1. Isometric wrist flexion (left) and wrist extension (right) are performed by pushing the involved hand into the non-involved hand. Have the top hand add equal pressure to prevent any motion from occurring. Make sure these contractions remain pain-free while performing. 2. Isometric pronation (left) and supination (right) are performed by pushing the involved hand into the non-involved hand. Have the non-involved hand add equal pressure to prevent any motion from occurring. Make sure these contractions remain pain-free while performing. 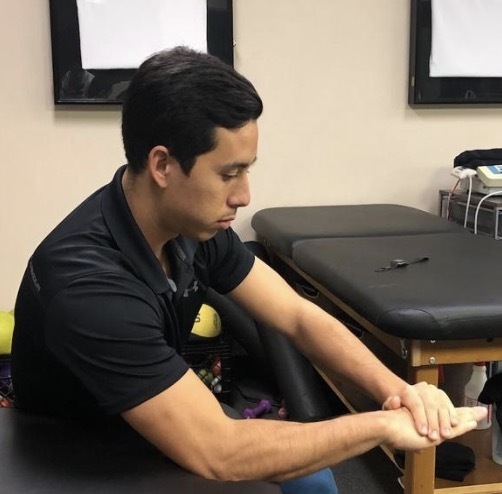 Eccentric training of the wrist extensors has been shown in the literature to be effective in treating elbow tendinopathy. You can start these exercises once isometric loading has improved and is no longer painful. 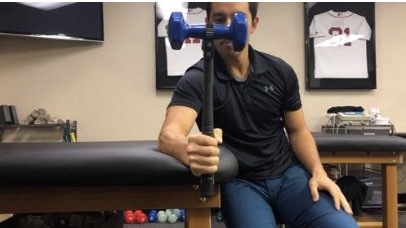 Eccentric strengthening involves lengthening the wrist extensor tendons under a challenging load, in this case a dumbbell (3). 3. 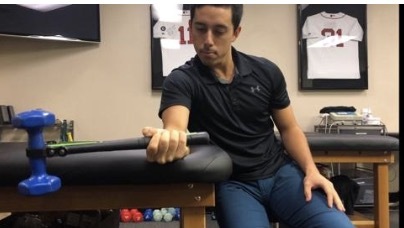 Eccentric wrist extension – Start in wrist extension and slowly control the weight as it descends down into wrist flexion . 2 sets of 10 with a 2 second downward phase. 4. Eccentric pronation / supination - perform 2 sets of 10 reps. Control the weight as you slowly lower the hammer into supination (left) and pronation (right). 5. Eccentric Thera-Band FlexBar Perform 3 sets of 15 reps.
6. 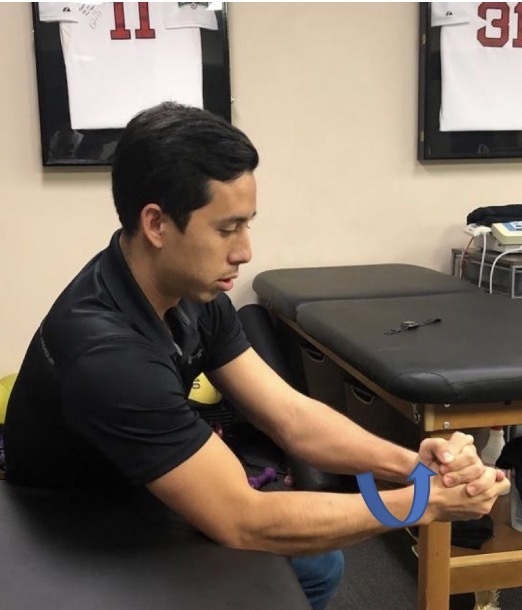 Soft-tissue mobilization, changing your string tension/string, improving mobility, and strength can help alleviate your nagging elbow pain (4). Don’t let nagging elbow pain get in the way from you playing on the court this season! Give these simple exercises a try to get back on the court pain-free. 2. Ellenbecker, T. S., Nirschl, R., & Renstrom, P. (2012). Current Concepts in Examination and Treatment of Elbow Tendon Injury. Sports Health: A Multidisciplinary Approach, 5(2), 186–194. 4. Tumilty, S., Munn, J., McDonough, S., Hurley, D. A., Basford, J. R., & Baxter, G. D. (2010). Low Level Laser Treatment of Tendinopathy: A Systematic Review with Meta-analysis. Photomedicine and Laser Surgery, 28(1), 3–16.